1. Heat 3 tablespoons olive oil in a wide, deep pot over medium heat. Cook the onion until soft and very lightly browned, about 8 minutes. Add the garlic and stir to soften for about a minute. 2. Add the rice and stir to coat in the oil. 3. Add 1 cup of hot vegetable broth or stock and stir gently until the rice absorbs it. Repeat with a second cup. Next, stir in the wine. When that evaporates, add the greens mixture to the pot in increments if necessary, stirring to combine with the rice-onion mixture. When all the greens have been added and are wilted, pour in another cup of hot broth or stock, and repeat as needed until the rice is creamy and al dente and the greens cooked, about 30 to 35 minutes in total. 4. Stir in the dill. Season to taste with salt, pepper and lemon juice. 5. 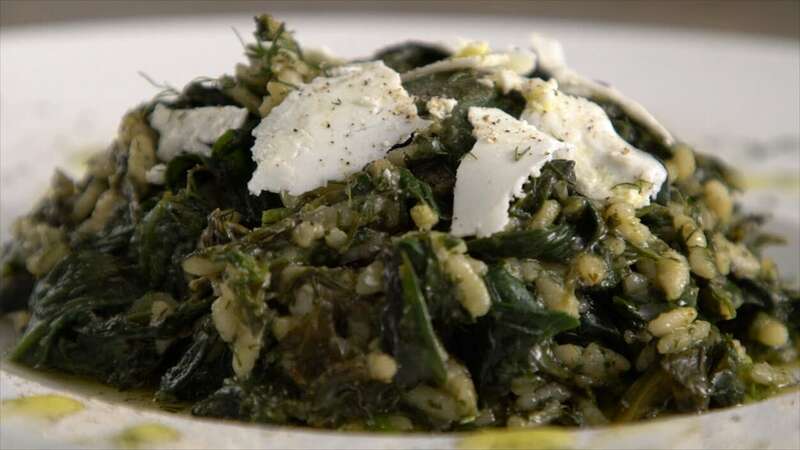 Serve with shaved feta on top and a drizzling of Vrisi 36 Delicate Extra Virgin Greek Olive Oil. This entry was posted in Uncategorized and tagged diane kochilas, my greek table, recipe. Bookmark the permalink.